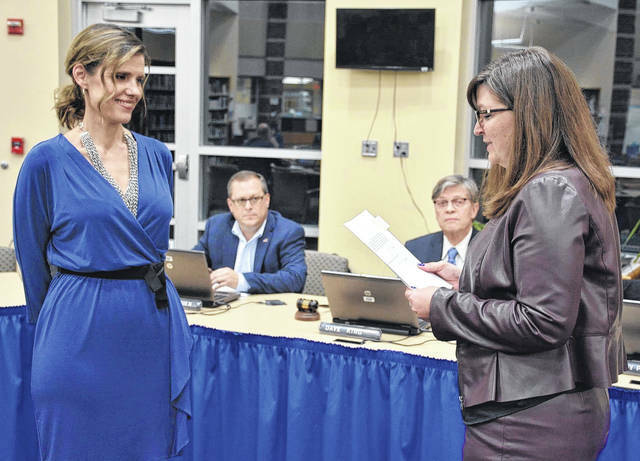 Olentangy Local Schools Board of Education member Mindy Patrick, left, is sworn in as president by Treasurer Emily Hatfield during the board’s annual organizational meeting held Jan. 11 at Liberty High School. The Olentangy Local Schools Board of Education last week selected outgoing Vice President Mindy Patrick as its president for 2018. Nominated for the position by board member Julie Wagner Feasel, Patrick — elected to the board in November 2015 — has replaced outgoing President Roger Bartz. According to her biographical information on the district’s website, Patrick holds a bachelor’s degree in finance from Oakland University (Michigan). After stints in the corporate finance world at General Motors and Detroit Diesel, Patrick worked in commercial and residential construction finance before taking a position at CAMS Inc. in Powell. A founding member of the Olentangy Dyslexia Network, Patrick has served on the Olentangy Cost Efficiency Committee and is an advocate for higher literacy standards. Following Patrick’s appointment as president, board member Kevin O’Brien was selected to serve as vice president. Prior to Patrick and O’Brien being sworn in as new board president and vice president, respectively, Treasurer Emily Hatfield gave the oath of office to board members Dave King and Wagner Feasel, both of whom were re-elected to the board by voters in November. The board voted in favor of establishing the Board Service Fund, which will contain $5,000 to be used to pay for expenses incurred by board members in the performance of their duties. According to a district document, Ohio Revised Code allows BOEs to establish a service fund not to exceed $2 per child enrolled in the district or $20,000, whichever is greater. Membership in the Ohio School Boards Association for 2018 was approved by the board.